I recently found out that February 5th is World Nutella day. This is great news because I have a not so secret obsession with Nutella. So, what did I do? I spent all week cooking with my favorite chocolate hazelnut spread, of course! 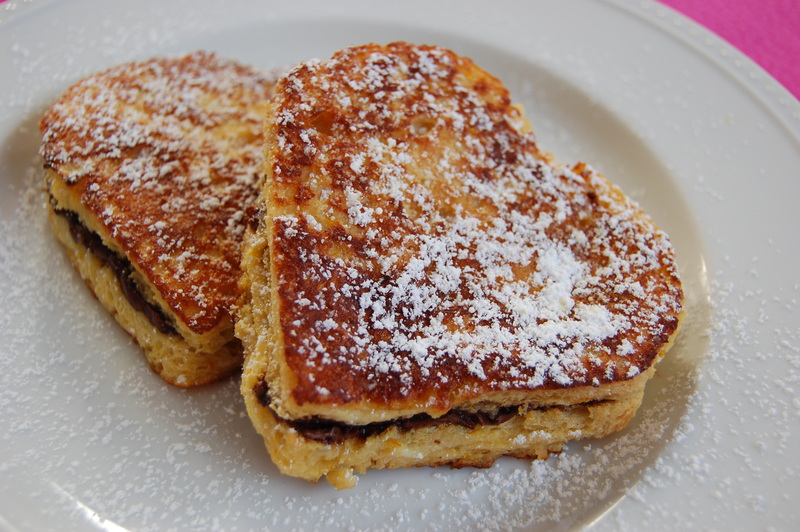 This stuffed french toast recipe is so decadent, it could pass as dessert. 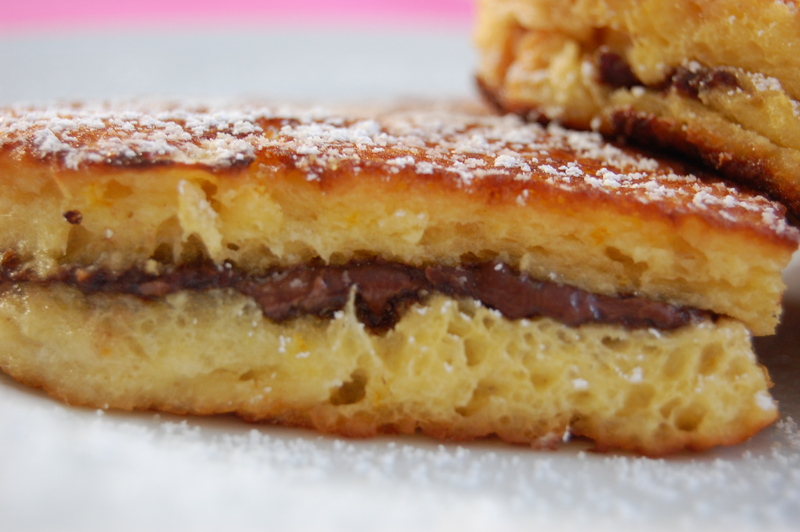 The Nutella center makes it sweet, so there is no need for syrup and the addition of fresh orange juice and orange zest in the batter creates a flavor combination that is to die for. 1 loaf brioche bread or a bread of similar consistency, day old is preferable. You will need about 10 slices. Slice your bread into 1/2 inch thick slices. I used a cookie cutter to cut out hearts in honor of Valentine’s Day, but feel free to leave the crust on if you prefer it that way. 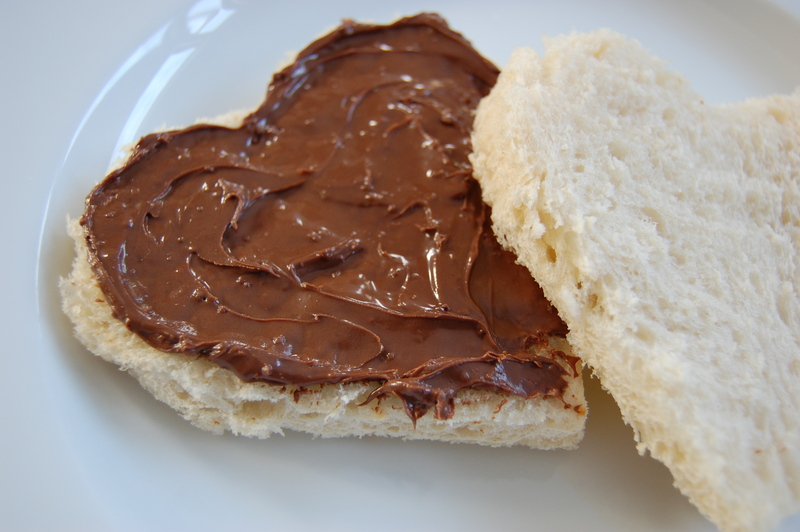 Spread a layer of Nutella on the bread and cover with another slice of bread, creating a Nutella sandwich. The amount of Nutella is up to you, the more you load on, the sweeter it will be! Combine eggs, milk, orange juice, orange zest, vanilla, sugar and salt in a shallow bowl and whisk. Next, Place about 1 Tbsp vegetable oil in a pan and heat to medium or medium low heat. 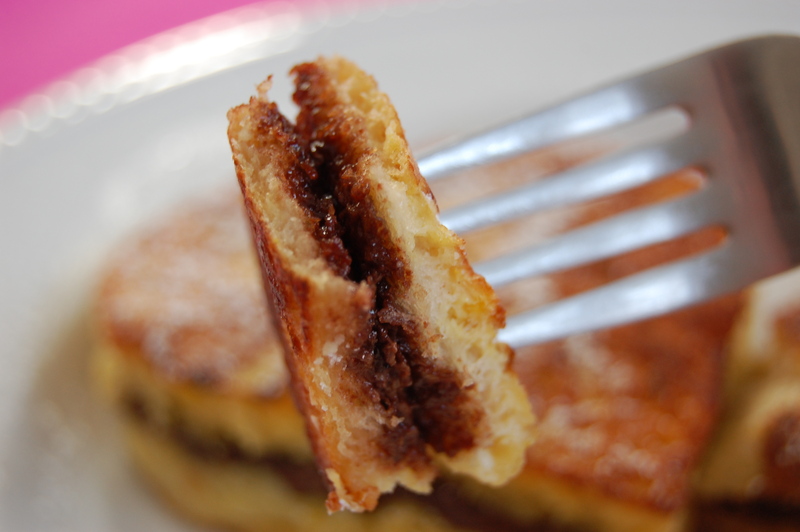 Dip one of your Nutella sandwiches into the batter until it is fully coated. Be careful not to soak your bread or you might not have enough batter to get through all your french toast. Cook in the oiled pan until golden brown on both sides and fully cooked. Because the french toast will be thick, you might feel that the sides didn’t cook and crisp up as nice as you would like. If this happens, just place them in the oven at 300 degrees for about 10 minutes or until nice and crispy on the outside. This also works well for keeping the first couple warm while you finish making the rest. Repeat dipping and cooking the french toast, adding oil to the pan each time. Once they are complete, dust with powdered sugar and enjoy! Love Nutella and love the heart shapes! So cute and a great Valentine’s Day breakfast idea! LOVE the heart shape and the orange part sounds delicious! Looks delicious! My boys would think I’m the best mom ever. Might just have to try it this weekend. Nice twist on a traditional dish — orange & nutella! Fabulous combination. Thanks for sharing the love! This was SO yummy! Thanks for sharing. My new favorite holiday is World Nutella Day! Oh my, I think I’m in love with your French toast. I just did a French toast blog post myself but this sound incredible! I’ll have to try it on Valentine’s Day! I tried this with Jason’s version of Nutella. It’s less sugary and has more chocolate. Awesome! This looks so, tempting! oh dear back to the kitchen. oooh yum! I love Nutella! and the thought of chocolate for breakfast…great idea!! And love the heart shape! im totally loving all of the nutella recipes and this looks amazing. My goodness that looks good. Love the heart shape and the orange twist, very creative!! This appears to be practically too fabulous for words, but I will use two – I’m drooling. Mmm, this does sound decadent! What a lovely breakfast treat! Looks so scrumptious- and easy! Thanks for sharing. Wonderful! This is such a great recipe. I can’t wait to try it! I haven’t tried mango and cinnamon, but that sounds amazing! The combination of chocolate and orange reminds me of Terry’s Chocolate Oranges… delicious! And how did I not know about World Nutella Day?! It’s brilliant. Just go to the refrigerator and immediately come back for new suggestions. Sorry, but at the sight of such delicacies just need to eat something! When I saw this recipe I just had to try it instantly. And all I can say is that…IT WAS AMAZING! This is such a fabulous idea! I am a huge Nutella fan and am drooling about the thought of it oozing out of warm French Toast, especially with the orange flavor accent. I will surely be making this and would love to link your blog to my post! Totally making the Nutella french toast. Oh lord, yum. Is there any substitute for egg? This looks too good for me not to try it!